Savvy participants in the global tonic water market are pitching flavored products to customers in order to up demand and sales. To that end, they are pouring money into research and development of innovative products. Majorly fuelling the global market for tonic water is the rising disposable income of people on account of industrialization and economic growth. Rapid urbanization too plays a role in stoking demand for it has resulted in increasing intake of alcohol to which tonic water is often added. Apart from that the surging popularity of social media and the internet has had a positive influence on the market too. As study by Transparency Market Research projects the global tonic water market to pull in a revenue of US$2.45 bn by 2025-end by rising at a CAGR of 6.1% from 2017 to 2025. The report estimated the market was worth US$1.52 bn in 2017. The global tonic water market can be segmented based on different parameters. Depending upon application, for example, it can be divided into direct consumption and alcoholic drinks. Of them, the segment of alcoholic drinks grosses most of the revenue in the market on account of the increasing alcohol intake worldwide. This, in turn, has resulted from the changing lifestyles leading to increasing social gatherings and parties, and the popularity of social media and internet, and the growing perception that alcoholic drinks relaxes the mind. 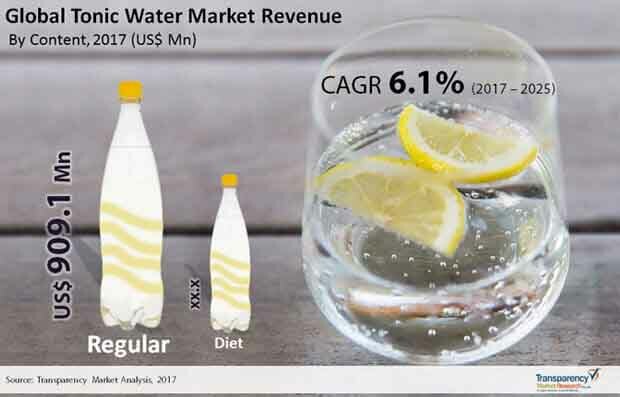 The tonic water market in alcoholic drink segment is forecasted to clock a higher CAGR of 6.6% between 2017 and 2025 to become worth US$1.87 bn by 2025, while in direct consumption segment is predicted to rise at a 4.7% CAGR in the same period to attain a value of US$578.4 mn by 2025. Depending upon the sales channel again, the global market for tonic water can be divided into direct sales and retail sales. The retail sales segment is further divided into modern trade, convenience stores, online retailing, and other retailing formats. The direct sales segment is predicted to expand at a higher CAGR of 7.5% CAGR from 2017 to 2025, while the retail sales segment is expected to register a 5.4% CAGR in the forecast period. Geographically, North America, Latin America, Asia Pacific, Europe, and the Middle East and Africa are the key regions studied in the report. At present North America and Europe market dominate the global market for tonic water volume-wise. By 2025, the two regions are expected to collectively account for 67% share in the global market. This is because of the surging popularity of gin and vodka in Europe, with which tonic water is usually added. Asia Pacific is another key market for tonic water which is expected to rise at a steady CAGR of 5.7% during the period between 2017 and 2027 on the back of rapid industrialization and urbanization – the two phenomena that have increased the disposable incomes of people and changed their lifestyles leading to more alcohol intake. Latin America is expected to expand at a CAGR of 4.8% because of changing lifestyles, rising urbanization and increasing per capita income in this region. Some of the prominent participants in the global tonic water market are Fentimans Ltd., The Coca-Cola Company, Diageo Plc., Q Drinks, White Rock Products Corp., Powell And Mahoney LLC, Fevertree Drinks PLC, Monster Beverage Corporation, MBG International Premium Brands GmbH, East Imperial Superior Beverages, JACK RUDY COCKTAIL CO., Boylan Bottling Co Inc., Casalbor, S.L., Sygama SA, Luscombe Drinks, and Bradley’s Tonic Co.
Transparency Market Research offer 8-year forecast for the global tonic water market between 2017 and 2025. The global tonic water market is expected to register a CAGR of 6.1% during the forecast period. The primary objective of the report is to offer insights on the advancements and opportunity in the global tonic water market. The study demonstrates market dynamics that are expected to influence the current challenges and future status of the global tonic water market over the forecast period. This report also offer updates on trends, drivers, restraints, value forecasts, and opportunities for manufacturers operating in the global and regional tonic water market. Increasing urban population coupled with factors such as increasing disposable income, modernization etc. and increasing number of clubs, lounges, and bars are expected to boost the sales of tonic water market over the forecast period. Continuous launching of tonic water with different flavors in order to attract consumers and to grow curiosity among individuals to try new flavors is anticipated to increase demand for flavored tonic water in the near future. Further, the report contains all the necessary details regarding the driving and restraining forces the manufacturer in going to face over the forecast period. The Global tonic water market is segmented based on its content, product type, application and sales channel. On the basis of content, the Global tonic water market is segmented into regular and diet. On the basis of product type, the market is segmented into non-flavored and flavored. On the basis of application, the Global tonic water market is segmented into alcoholic drinks, and direct consumption. On the basis of sales channel, the market is segmented into direct sales and retail sales. The retail sales segment is further sub segmented into modern trade, convenience stores, online retailing and other retailing formats. The report includes market share of each segment according to the region with analysis towards market trends respectively. A section of the report highlights tonic water demand. It also provides a market outlook for 2017–2025 and sets the forecast within the context of the tonic water ecosystem, including the new product developments as well as product offerings in the global tonic water market. This study discusses key trends contributing to growth of the global tonic water market, as well as analyses the degree to which drivers are influencing the global market. In the final section of the report, a competitive landscape has been included to provide report audiences with a dashboard view. Key categories of providers covered in the report are the key players of the global tonic water market. Detailed profiles of the providers are also included in the scope of the report to evaluate their long-term and short-term strategies, key offerings and recent developments in the tonic water market. Key players in the global tonic water market includes Fentimans Ltd., The Coca-Cola Company, Diageo Plc., Q Drinks, White Rock Products Corp., Thomas Henry GmbH & Co. KG, Powell And Mahoney LLC, Fevertree Drinks PLC, Dr. Pepper Snapple Group, Inc., Monster Beverage Corporation, MBG International Premium Brands GmbH, East Imperial Superior Beverages, JACK RUDY COCKTAIL CO., Boylan Bottling Co Inc., Casalbor, S.L., LLANLLYR WATER CO LTD, Shasta Beverages, Inc., Sygama SA, Luscombe Drinks, and Bradley’s Tonic Co.
Also, another key feature of this report is the analysis of all key segments in terms of absolute dollar. This is traditionally overlooked while forecasting the market. However, absolute dollar opportunity is critical in assessing the level of opportunity that a provider can look to achieve, as well as to identify potential resources from a sales and delivery perspective in the global tonic water market.